With all that in mind, we’ve decided that the time is right to reflect this ongoing evolution with a visual refresh of the Firefox logo and product icon. 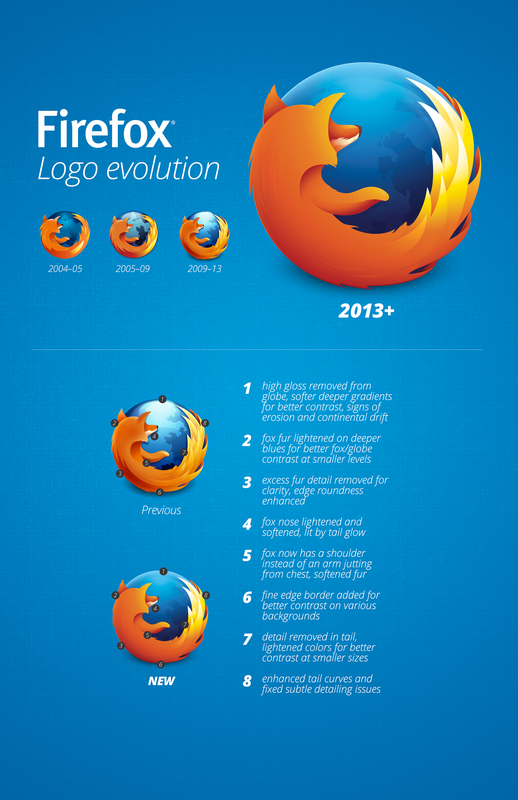 As you can see from the graphic above, the basic concept remains exactly the same, but it’s been modernized to reflect Firefox’s role in the ever-changing Web of 2013 and beyond. Unlike previous versions, the updated logo was created specifically with mobile in mind. Although we think it looks great at any size, it’s been optimized to be crisper and cleaner on small screens and lower resolution devices. However, it also scales quite nicely for use in retina displays, and (unlike previous versions) can be accurately recreated in SVG so it’s more ‘of the Web’. This 2013 edition of the logo was created by the always-awesome Sean Martell, who has provided plenty of juicy details about the design over at his blog. It’s making its first in-product appearance with today’s desktop release of the Firefox 23 beta, and will be rolled out across all other Firefox versions as well as websites and promotional materials in the coming weeks.